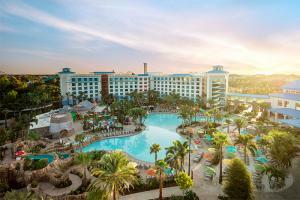 Universal's Loews Sapphire Falls Resort transports guests to a paradise in the heart of the tropics. Blue waterfalls cascade over lush grounds, and in the distance, the calming sounds of steel drums call guests to take in the scenic water views, ease into ‘island time’ and let go. Imagine a picturesque hotel built in the heart of the tropics, where every comfort is included. Universal's Loews Sapphire Falls Resort features a beautifully landscaped, resort style pool with a water slide surrounded by cascading waterfalls, this hotel truly captivates at every turn. Located at Universal Orlando® Resort in Florida. New Dutch Trading Co. - Snacks, meals, and beverages; Strong Water Tavern - Ceviche bar and vintage rums; Amatista Cookhouse - Caribbean cuisine; Drhum Club Kantine - Fresh seafood and taste-tempting tropical drinks.